San Jose, Calif. – September 19, 2017 – Angie Hospitality, creator of the world’s first 24-hour interactive guest room assistant, Wi-Fi and room control technology solution purpose-built for hotels and resorts, has been asked to provide insight on its game changing solution at the HTNG North American Insight Summit. The event is scheduled to take place September 26-27 at the Westfields Marriott Hotel in Chantilly, Virginia. Angie Hospitality will present audience members with an informative presentation on Angie’s multiple features and benefits at 3:45 p.m. on September 26 in the Lincoln Forum Auditorium. With leading members of the hospitality community expected to attend, valuable details will be provided on how increasing trends in online and voice-activated services can now be leveraged in a way that maximizes guest satisfaction, streamlines hotel operations and provides additional revenue opportunities. Since its launch, Angie has served as the world’s first cloud-managed, enterprise-class, voice- and touch- interface based guest room assistant and integrated room control device. With reliable internet service being rated as one of the highest priorities among guests, Angie also serves as a secure, in-room Wi-Fi access point that guarantees a fast and seamless online experience. 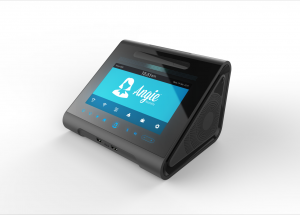 Equipped with advanced, multilingual voice and high-resolution touch screen interfaces, Angie provides guests with the ability to make requests for services or amenities via simple voice command, or alternatively through Angie’s interactive touch screen. Options include the ability to instantly connect multiple guest devices to Wi-Fi, set alarms, play music, make phone calls, and confirm or make reservations. In addition to revolutionizing and maximizing the guest hotel stay experience, Angie also has the ability to allow hoteliers to streamline service, save staff time and expense, and boost revenue. For example, using the latest built-in occupancy sensor technology, Angie can recognize when rooms become unoccupied, and can automatically adjust temperature or lighting in order to minimize utility expenses. As a property’s environmental footprint becomes more important to both hoteliers and their guests, this feature can prove vital in meeting sustainability and energy efficiency goals. With hotels seeking to make up for decreasing revenue from in-room sales such as video-on-demand and minibar purchases, Angie’s digital display screen can also serve to strengthen profits by promoting on-site amenities including restaurants, spas and retail outlets. Hotels can additionally offer event organizers a way to engage and communicate with conference and meeting attendees, using a new interactive in-room medium. Recently named winner of the prestigious HTNG TechOvation Award during HTNG’s HT-NEXT 2017 Conference, Angie is currently being implemented at multiple hotel properties in the U.S. and will be available for general distribution later this year. For more information on Angie’s full suite of options and capabilities, please visit www.angie.ai. About Angie Hospitality | Angie Hospitality, led by hospitality industry veterans, designs and develops the only 24-hour interactive guest room assistant, Wi-Fi and room control technology solution built just for hotels and resorts. The 2017 HTNG TechOvation Winner, Angie is the world’s first enterprise-class, cloud-managed platform built on a secure, scalable, and highly-available architecture that is continuously monitored and enables her to self-configure for each property and room as soon as she’s plugged in. With headquarters in Silicon Valley and London, Angie Hospitality currently offers services in North America and Europe, expanding soon to Asia Pacific and the Middle East. For more information on Angie Hospitality, please visit www.angie.ai and connect with us on our social media channels – Facebook, Instagram, Twitter and YouTube.